ACC Academic Honor Roll (2016). Currently 28th in FSU history in career scoring average (73.09). His eight career eagles are tied for the ninth most in school history. Made one appearance in the fall 2018, carding a 2-over 218 at the Golf Club of Georgia Collegiate Invitational. Made more strides as a junior, shooting a career-low 72.30 in 10 events played (30 rounds). Recorded four Top-10 finishes, highlighted by winning the USA Individual Tournament at 4-under on Feb. 13, 2018. One of four Seminoles to shoot 6-under in a single round in 2017-18, carding a 66 in the second round of the Gary Koch Invitational. Also recorded Top-10 finishes at The Doc Gimmler (T10th), the Gary Koch Invitational (T6th) and the ACC Championship (T8th). Shot par or lower in 15 of his 30 rounds played. Totaled eight rounds in the 60s, twice the amount of his previous season high of four in the 2016-17 season. His aggregate score of 207 at the ACC Championship marked a new career low (9-under). Led the Seminoles with four eagles in 2017-18, tying his 2016-17 total for the seventh-most by a Seminole in a year. His 3.10 par 3 scoring average is the 10th lowest by a Seminole in a single year. Had four eagles for the second consecutive year, tying for the seventh-most in a season at FSU. Showed great improvement in second year, shooting 73.19 in eight events. Shot +1.48 vs. par, cutting down his average dramatically from his freshman year. Recorded two Top-10 finishes, tying for eighth at the ACC Championship (2-under 214) and tying for 10th at the Cabarrus County Irish Creek Intercollegiate (-2 211). His three-round score of 211 at the Cabarrus County Irish Creek Intercollegiate tied his career low, matching the 211 he shot in his debut at the 2015 Fighting Illini Invitational. Finished at par or better in nearly half of his 21 rounds played (nine rounds). His low rounds of the year including a pair of 4-under 68s in the first round of the Seminole Intercollegiate and the second round of the Southern Intercollegiate. Recorded four eagles on the year, tying for the seventh-most in a season in FSU Golf history. Led the Seminoles with a 4.59 average on par-5 holes, the second-best in a year in school history while ranking 26th nationally. • Played in five tournaments as a freshman, shooting a 74.71 in 14 rounds overall. • Showed glimpses of his potential in the Fall 2015, shooting a 66 in his collegiate debut at the Olympia Fields Invitational. • Tied for ninth at the Olympia Fields Invitational, finishing with a 1-over 211. • Played six rounds in the fall and had a scoring average of 73.17. • Tied for 41st at the Seminole Intercollegiate, including a 2-under 70 in the second round. Played golf locally at Chiles High School. Named the Tallahassee Democrat’s All-Big Bend Player of the Year in 2013 and 2014. Three-time Tallahassee Democrat All-Big Bend First Team selection. Won the AJGA Junior Steelwood in 2013 after shooting a 202 (71-65-66). Winner of the Florida Junior Tour at Southwood Country Club in 2015 with a two-day score of 138 (72-66). 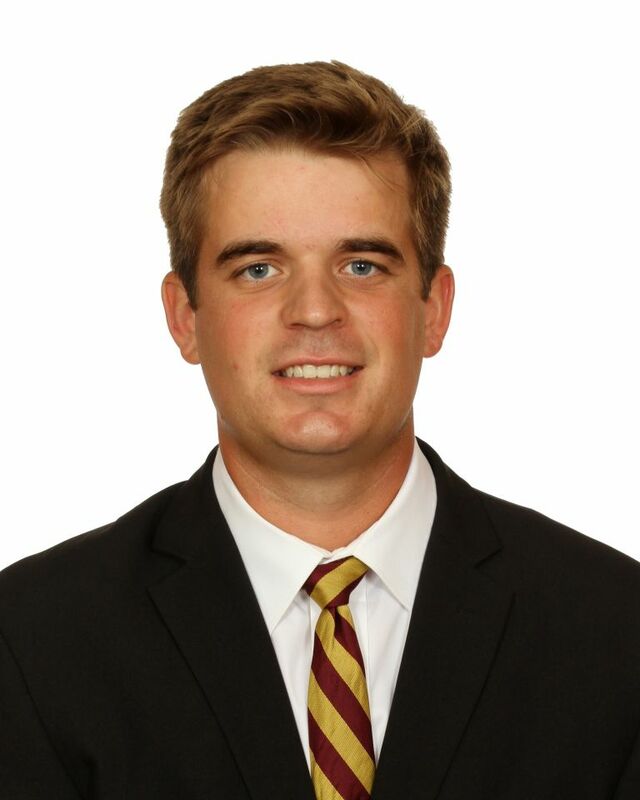 Posted four Top 15 finishes in Florida State Golf Association tournaments in 2013, including a fifth-place finish at Pensacola Country Club with a score of 148. Placed third at Brooksville Country Club in 2014 with a 144 (72-72) over two days. Second place at the 2014 AJGA Taylor-Made Adidas Golf Junior at Innisbrook (217 – 72-74-71). Shot a 281 (67-72-70-72) and placed 14th at the Southeastern Amateur in Columbus, Ga.
• Born: November 1, 1996. • Parents: John and Leslie Baker. • How did you first start getting into golf? My dad. • What would you say is your greatest golf moment so far? Holing out at NCAA Regionals. • Who is your favorite professional golfer? Tiger Woods because he got me loving the game as a kid. • My favorite club in my bag is: My putter because it looks good. • I chose to play for Florida State Men’s Golf because: It had been my dream growing up. • What is something many people don’t know about you? I’m good at video games. • What is the best advice you have ever received? Stay patient in a tournament, especially if you’re in contention. If the person you are playing birdies the first three holes, so what. Yours are coming. • What music are you currently listening to? Everything. • What shows are you currently watching? Breaking Bad and Entourage. • What’s your favorite movie? John Wick. • Outside of golf, what are some of your passions in life? Family and friends. • What is the single greatest lesson golf has taught you? To be respectful and have good personal skills. • What are the top three things on your bucket list? • If you could be any superhero, which one would you be? Bane because of his goatee. • What makes Florida State University a great place? The tradition and things available to us to get better.